An iconic 37 year-old, 55,000 ton archive building in Atlanta, Georgia, known locally as the “white ice cube,” was flattened on Sunday with ruthless efficiency… and it was all captured on camera. Some 500 pounds (226 kilograms) of explosives were detonated to bring down the Hammond Exchange Building in a controlled implosion triggered by Devin Simmons, a 5-year-old patient from the local Children’s Health Care of Atlanta facility, according to WSBTV. In the late 1990s, engineers determined that the cost of refurbishing the building, which had sustained structural damage due to groundwater and the construction of a nearby freeway, would be prohibitively expensive when compared to the cost of simply moving the archives. The building was officially vacated in 2016. 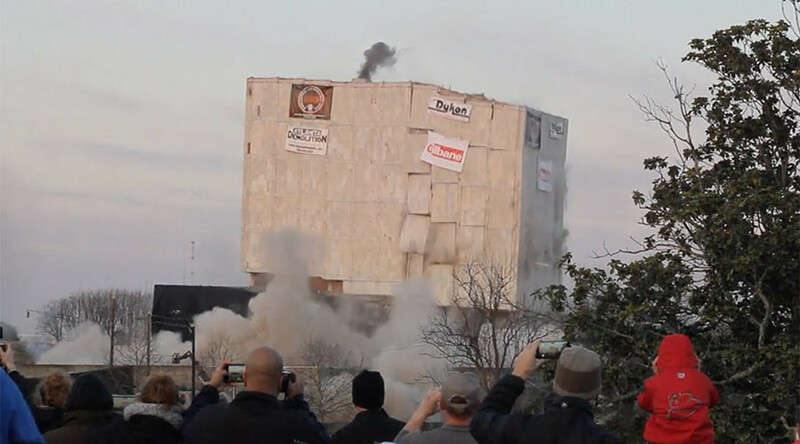 So effective was the demolition that the building fell to the ground at an aesthetically pleasing 45 degree angle. Its unique silhouette had marked the skyline for decades and its absence was soon noticed once the dust had settled. Though roads and bridges in the immediate vicinity were closed as a precaution, the demolition went smoothly and without incident. The site is due to be redeveloped as a new judicial center that will house the Georgia Court of Appeals and the Georgia Supreme Court reports NBC.